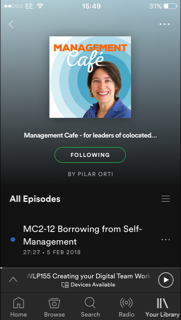 In this episode, Pilar and Lisette talk about their recent experience being involved in a day online event on working in virtual teams. This might be of interest if you are involved in organising a virtual event for your team or community. Lisette’s update, she’s found the perfect editor! The diversity of opinions even in a group that shares a passion for making remote work, work. Why it was an “internal affair” and not a “conference”. How we organised the event collaboratively, asynchronously. Pilar’s experience facilitating an audio-only session and how she discovered what she needs as a facilitator. Thoughts from the chats on building culture asynchronously and taking an “office optional” approach. Pilar shares her impressions from a talk she attended by Sinead Lynch, Chair of Shell UK: we don’t need slides when we have something to say!